J.G. FARRELL (1935-1979) is one of my favourite authors. His three early novels, A Man from Elsewhere, The Lung and A Girl in the Head, have been overshadowed by his four later novels: Troubles, the Booker Prize-winning The Siege of Krishnapur, The Singapore Grip and The Hill Station (uncompleted at the time of his death). In early 1979, the Liverpool-born novelist bought a farmhouse in Bantry Bay on the Irish coast. On August 11, he was caught in a storm while fishing from a rock near his home and was washed out to sea. His body was found a month later. He was just a few months short of 44. For a complete biography of J.G. Farrell, you might like to read Lavinia Greacen’s J.G. 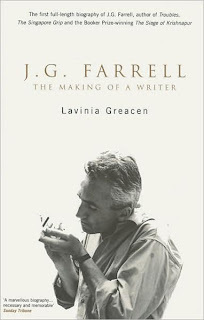 Farrell: The Making of a Writer, first published by Bloomsbury in 1999, and the recently-published J.G. Farrell in His Own Words: Selected Letters and Diaries (Cork University Press, October 2009), edited by Lavinia Greacen.